After being diagnosed with Rheumatoid Arthritis in 2006, I read some articles from reliable hospitals like Johns Hopkins. Sometimes I looked up symptoms online or read patient comments on large websites like Health Central or WebMD. Eventually I entered discussions with others, mainly to encourage them or link them to helpful information. The need seemed so great. I found people who were hurting and confused. 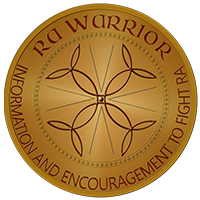 There was so much conflicting or wrong information and inadequate medical help that some patients felt like they were “atypical” or “crazy.” I decided to create a website, Rheumatoid Arthritis Warrior, with a blog that could speak to the reality of RA from a patient point of view. In May 2009, I began RAW, and by fall the first version of the site was complete. The American College of Rheumatology scientific meeting was in Philadelphia that year. I was absorbed by the few news reports online. 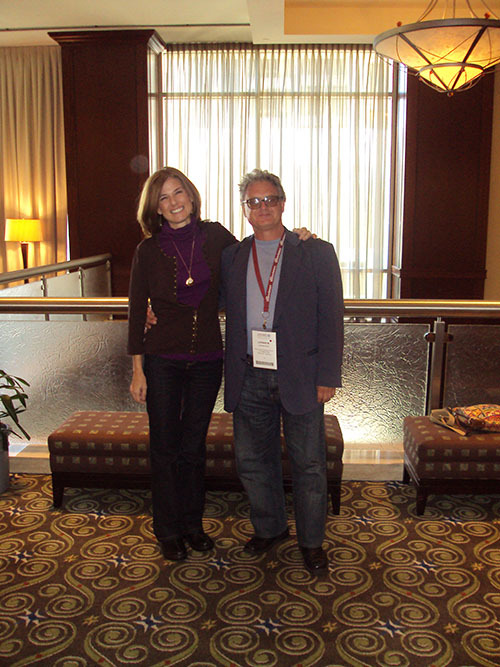 A friend who attended encouraged me to someday bring the patient voice to ACR. We can blame him for the rest of this – really. In 2010, I applied to ACR for a press pass to cover the meeting for our growing patient community. It took a little wrangling, but I got it. 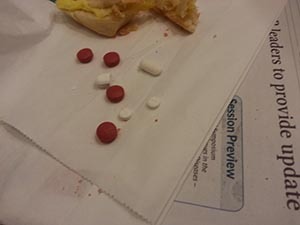 To prepare to be the patient with a press pass, I spent weeks resting up, working from bed, getting injections (spine and fingers), and new medications. I had to buy closed shoes (God forbid). 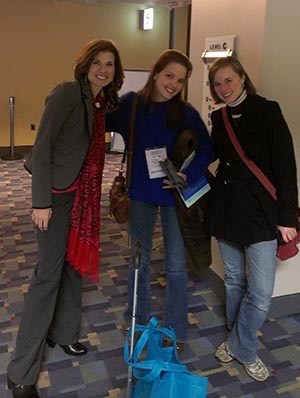 During that week in Atlanta, KB and I got to talk face to face with some top researchers, as well as people I’d met online including a rheumatologist from the other side of the world (the first ever #RHEUM TWEETUP!) and a patient who became a dear friend. I also had good meetings with pharma peeps and an ACR official. Did I learn some things about Rheumatoid Disease and medical research? Yes. But the most significant result was an enduring conviction about the critical need for the patient voice to participate in rheumatology. Within a few weeks the Rheumatoid Patient Foundation that friends had dreamed with me about was born. In November 2011, I reported from the ACR meeting in Chicago and the RPF presented its first exhibit with about a dozen volunteers from around the country. We passed out brochures and posters and met with people from industry and organized a fabulous 2nd ever #rheum Tweetup with patients, doctors, and industry peeps. It’s not possible to tell you in a few short words how hard it was and how much work was required. 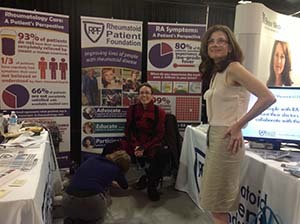 But we knew we’d taken huge steps for rheumatoid-patientkind. In November 2012, the RPF presented new brochures and posters, and expanded its exhibit with beautiful vertical banners. We videotaped two healthy volunteers wearing the arthritis simulation suit, including Dr. John Davis, our advisor from Mayo Clinic. A friend in industry organized the 3rd #rheum Tweetup, expanded to over 25 people – a groovy mix of doctors, patients, and industry reps.
2) An invited speaking session on using patient engagement to improve clinical care. 3) Three brand new RPF brochures, including ones on methotrexate and treat to target. And this year I’ve persuaded our dear friends at AI to participate with an exhibit. The San Diego Convention Center won’t be exactly overrun with PRD, but there’ll certainly be more than there ever was at ACR before. 1) The scientific sessions and the flashy pharma exhibits. 2) How a few PRD gave a voice to millions of PRD who might have once upon a time felt alone or crazy. NOTE: The 1st video is the short report at the end of ACR 2010. I didn’t plan what to say, but after I turned off the camera, KB and I wept as we were overcome with knowing that history had changed. The second video is an interview with the Mayo Clinic about why patients would want to attend the ACR meeting. Kelly, thank you for your perseverance in making life better for RD patients. Your posts keep me sane! Having spent a majority of my adult life with a large corporation, I know gaining entry to conventions is not easy. It’s amazing what you have done – to now be a participant and presenter at this annual gathering. Thank you for representing all of us and giving us a voice. Well done! I am so grateful for your strength & courage to fight so hard for our cause to educate what RD really is & how it is not just arthritis ! My daughter lives in San Diego so I would love to know when you will be at the convention center ? If she is able I would love for her to be able to meet you. Kathy would she want to stay for a couple hours as a volunteer in the exhibit? If so we can get her a badge for access. You can send me an email & I’ll give you my cell #. The exhibit days of the meeting will be Oct 27-29. You’ve come a long way Kelly from your press pass at the 2010 meeting. Now you have a real international network too, way beyond what could have been imagined in the “old days” of not so long ago. I’m glad to see that so many more people in health care are advocating for patients to be included in conferences. Hopefully our days of being in the healthcare basement continue on this course. We need more and more health literate patients to join their voices to this great movement. Dear Annette, I do think we’ve fought to be where we are, and still sense that it takes a lot of pressing on our side to get the access we have, much less the access we should have. We have sought out wonderful partners, but the establishment itself has not made it easy for us. 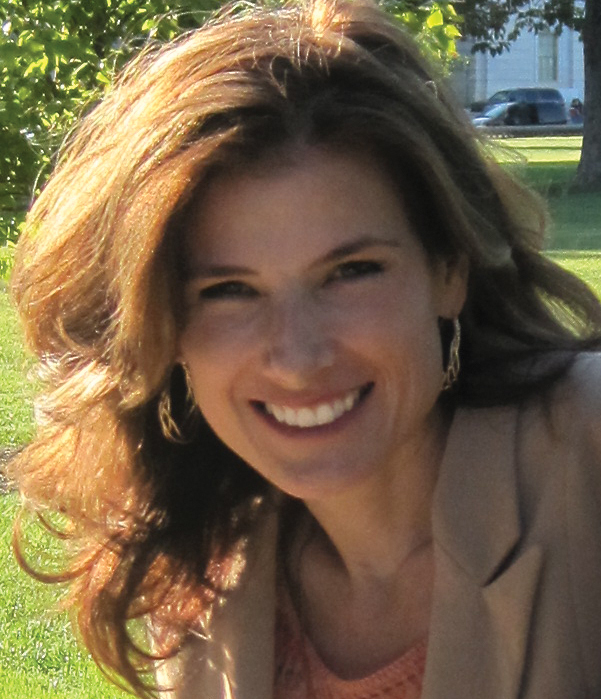 Kelly, You ARE the face of rheumatoid disease. You ARE making a huge difference for all of us who suffer from this painful malady. You ARE to be thanked and revered as a leader and innovator. We love you and support you. Thanks so much for all that you do and “knock ’em dead” at the ACR this year! 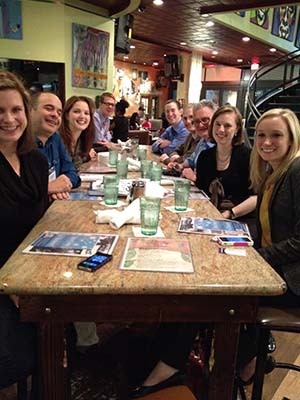 Pingback: #ACR13 TweetUp - San Diego - The Blog of Paul Sufka M.D. Thank you for your efforts! It gives me a great deal of hope that one day my doctor and I will both communicate about the same disease and make real strides in a better experience for me. And hopefully sooner I will not feel such anger at being told by him and other communities (like the Arthritis Foundation) about what I am or am not experiencing. So glad you have been persistent with this. With efforts to change the name to better reflect the reality of the disease, I am wondering why the abstracts use “Rheumatoid Arthritis”? Hi, I finally have a moment to reply (waiting at the dentist’s. office). The abstract that you can see is not the full poster (embargoed) much less the full article we hope to eventually submit. The poster does use both terms as I do in my talk as well. The main reason we used RA instead of RD in the abstract application was to preserve anonymity. The abstract application process is anonymous so the reviewers do not know who the applicant is. This sometimes means refraining from geographical terms or leaving out other identifying information. Since I had recently written so much about the terminology, that might have been an identifying factor at this time. Please also refer to other posts I’ve written on the name change process – I’ll try to post a link (using iPad). The process requires some forcefulness on our part (which I’ve had) but at times also patience. been really tired & rushed trying to finish up things for ACR so I left some things out of my reply – met with the printer after the dentist yesterday – that reminded me about the brochures – All of the new brochures we’re printing use RD. It’s a big bold step & we haven’t gotten any pushback from our distinguished advisors. Like I said yesterday, this is a process & a long-term perspective will be successful. Once my book is out, there will be a sea change in tactics for all of us – because the evidence will be at our fingertips. I so look forward to that – hopefully after ACR, I can wrap up those details. You have been there, done that, for us all! Thanks for taking us back to the beginning again, the beginning of when life for RA sufferers started to change. Words of thanks seem hardly enough, but, as said by many, you have done, and are still doing, what the rest of us cannot….THANKS! And lots of love! I think I’ll think especially of you and Kaitlyn if I’m nervous before my talk. I’ll remember I’m there to be her voice. If I think of the way I’ve seen some patients dismissed at times, that will help remember this can make a difference. I can’t really say much more than what has been said already. YOU ARE the voice of RD and we are all so proud of you. You do all of this while continuing to feel the pain and fatique we all feel. You are driven and on a mission. How lucky we are!!!!!!!!!! And the slides reminding me how aggressive and destructive this disease is. may you rest and recover your energy from this time. Thanks kelly you are a fighter ! “Voice of the patient” seems so obvious. Incredible that there wasn’t one until you took a stand. Congrats on the progress and all the very best to you and the other folks working with for a this year and beyond. I have been an RN for nearly 20 years. 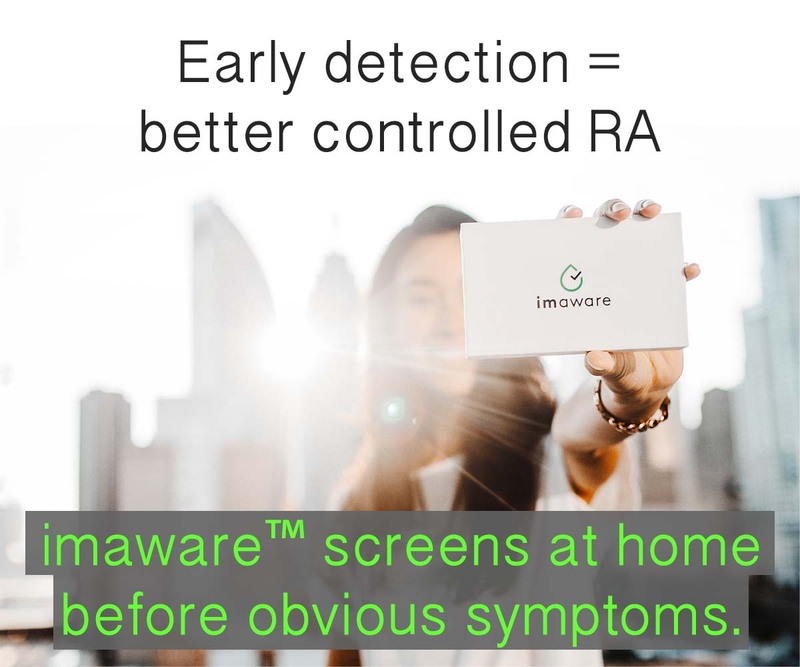 I thought I knew quite a bit about “RA” until I received my own diagnosis 3 years ago. You have taught me more about my RD than I ever learned professionally. I’m glad that I can now pass this along to my fellow home care clinicians & now my 17 year old daughter who is also starting this journey. Thank you! Kelly, I found your website recently and want to thank you for all of your time and effort to help those who are dealing with RA. I have an appt with a rheumy next week after spending the last 7 or 8 years agreeing with my last rheumy – no, I don’t have RA because I have no deformities. My symptoms are mild, annoying and inconsistent yes, but I can still move around and do what I need to do each day so no, I don’t have RA. Besides, my sister who was diagnosed at 29 had an acute onset, and I don’t have that so no, I don’t have RA. Over the past three months I’ve not had a day without some pain somewhere and in some interestingly new places. It started with being woken up in the middle of the night with sharp pain in my thumb and not being able to move it. Well, that’s weird, must be tendonitis in my thumb, mommy thumb? I do have a 9 month old and he is heavy so maybe that’s it. Now it’s different, the pain is peppered throughout my body…elbow, knee, feet, hands, hip and shoulder blade. I’m very nervous about this upcoming appt but I want you to know that I am encouraged by knowing you are out there advocating for RA patients. I’m a Marine spouse stationed in San Diego and wanted you to know that you will have a local gal with you on her mind and rooting for you at the upcoming ACR. Best wishes for safe travel and success at the convention. Most of all thank you…thank you for being a source of information, for standing up and for reminding us that we do not and should not allow ourselves to ever be at the mercy of those who dismiss us. Thank you Mandie. I grew up in the Corps & I’ll be thinking of you on our trip. Kelly, we can’t wait to get your feedback on your San Diego trip! We will support you 100%, and we wish you a comfortable trip and a successful one! Best wishes also to all others who attend and contribute….strength in numbers! Many gentle hugs to you all!